About 105 Daisy to Senior Girl Scouts are volunteering their time throughout the summer and into the fall at The Farm in Oyster Bay. They are helping plant seeds and plants, weed, stake up tomatoes, harvest the produce, and anything else that needs to be done! They are learning what it takes to maintain a tremendous Community Organic Garden! In the Girl Scout tradition, we will be donating our bounty to those in need, tasting some new veggies, and feeding the local rabbits. 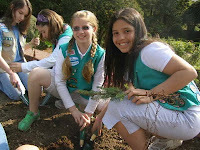 On May 15, 2010 we had “Dig It Day”, our kick off event, where the girls & leaders got a tour, heard what was expected, and planted some perennials, potatoes, and bush beans. As one parent said, “Where else but Girl Scouts can a girl get this experience?” After a morning spent in the garden, everyone enjoyed the beautiful day with a picnic lunch. Since then Troops have been tending to the garden on their designated weeks at The Farm. Under the direction of 5th generation caretaker, Amanda Roberts, everyone is learning about what it takes to grow vegetables at this wonderful garden site. Amanda even taught the girls about a Native American method of planting called The Three Sisters. Besides gardening, we are giving our girls and leaders a place to relax. I have heard more than one person say they feel like they are in another world! A world where the hubbub of everyday life seems to disappear the moment they enter the garden. GSNC is planning an old fashion picnic to reward all who tend the garden, on Monday July 26, 2010. We are also ending the growing season with a Harvest Day, where the Troops will help clean up the garden and enjoy some food prepared from their own hard work. What better way to see how our food goes from seed to table! This has been a difficult week at Girl Scouts of Nassau County. When we came to work on Tuesday after the holiday weekend we were dumbfounded to hear that our colleague and friend Debbie Capps had passed away. Debbie was 51 years young. Debbie had worked since 1999 in GSNC’s Information Technology Department, when we were still in our technology infancy. Debbie was a whiz with computers and quickly became a jack of all trades. In her early days here she maintained our website, worked on hardware when needed, and made sure that all staff knew how to use the software on our desks. Over the years she was promoted to Data Base Administrator; working with E-Council, she made sure that all of our data was managed safely and securely and that we could get the reports we needed. When our Fall Products and Cookie Programs went to online ordering it was Debbie who led the way. She generously re-arranged her work hours, had her phone calls forwarded to her home, and during the Product Program seasons she made herself available to our volunteers after dinner and into the wee hours to make sure that they got the answers they needed to support the Product Programs -- and most importantly to support the girls. Debbie always saw the big picture – she realized that technology was a tool to help all of us in our work to build girls of courage, confidence and character. Debbie always went out of her way to make the world a better place. Taking calls late at night. Volunteering at girl events. Serving on staff teams. Debbie was one of those ideal employees … impeccable performance reviews, always commended for going the extra mile. She was not part of one group or another, she was a friend to all, loved and respected by each of our staff team and by hundreds of volunteers. Debbie led a full and happy life aside from work. When I came to GSNC in 2000 she was a newly-wed, having married her husband Tom a few months before. She was a devoted mother to her two grown daughters, a great daughter, sister and friend. 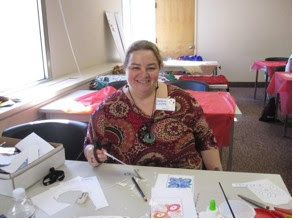 She was artistic, loved crafts, funny and always up for a challenge. Her daughter described her as the best Girl Scout Leader ever. Perhaps she was such a great staffer because she had been such a great Leader and it added to her understanding of our work. I’ve been blessed with a long and strong career, filled with interesting people who are devoted to the work that they do. I’ve only had a few staff people who have passed away when I was in previous jobs, and they were all much older and known to be in failing health. I know that we marked their passing with sadness and regret as well. Debbie – Deborah Ann – Capps will be so missed because she was so loved. My condolences and prayers go out to her husband Tom, her daughters Stephanie and Melissa, her many family and friends, and to her coworkers here at GSNC. There is such a hole in our hearts and in our office. P.S. The above photo of Debbie was taken at May’s “Cultural Festival Cruise,” a girl program where Debbie gave of her time and expertise.